The first Free Comic Book Day in 2002 was an idea from retailer Joe Field, owner of Flying Colors Comics, who saw the popularity of superhero movies as a way to introduce new readers to comic books. The thought was to piggy back on the advertising and promotion of a superhero movie; in fact, many retailers promote Free Comic Book Day at local movie theaters to driver traffic to their comic shops. The first Free Comic Book Day took place on May 4th, 2002 because it was the weekend Spider-Man opened in theaters. For the next two years, Free Comic Book Day occurred on the Saturday following a superhero movie release. In 2003, this was May 3rd due to the X2: X-Men United movie and in 2004 the date was July 3rd to coincide with the release of Spider-Man 2. It was decided for 2005 to have a set date, the first Saturday of May, regardless of a superhero movie release. Interestingly, while no superhero movie was released the same weekend as Free Comic Book Day in 2005 and 2006, every year from 2007 to 2016 has seen a superhero movie released the same weekend as Free Comic Book Day. So, what started as an annual event to promote comics by taking advantage of a new superhero movie release, has instead been used to promote a new superhero film by taking advantage of the distribution of free comics! 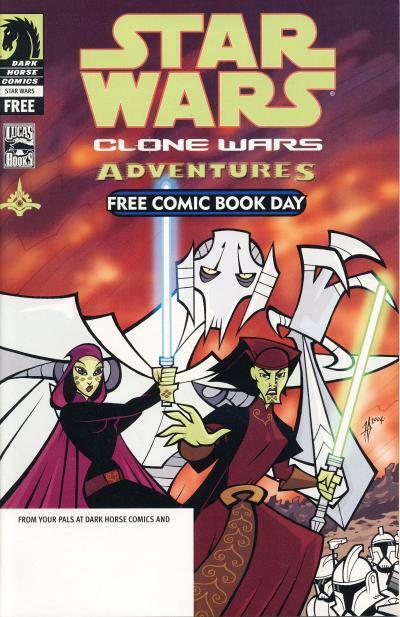 Dark Horse published a Star Wars comic on Free Comic Book Day eight of the thirteen years they held the Star Wars license. 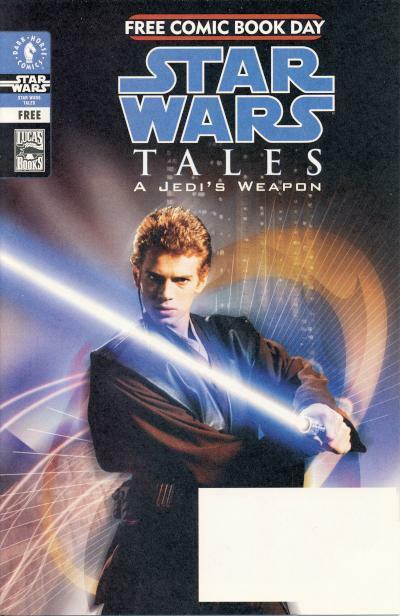 The first Star Wars Free Comic Book Day comic was a short story titled A Jedi's Weapon which was reprinted in Star Wars Tales #12 a month later. 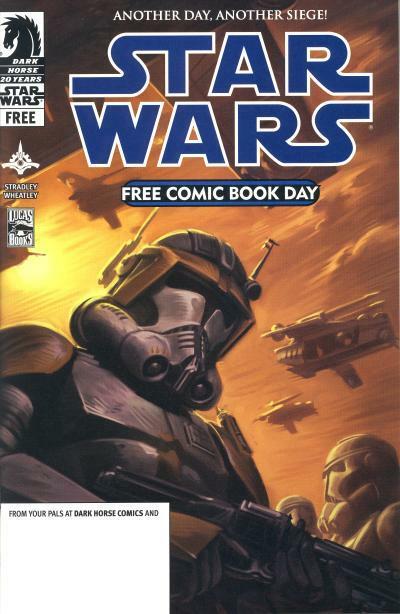 In 2004 and 2005, Dark Horse published 2 more standalone Star Wars comic books for Free Comic Book Day. 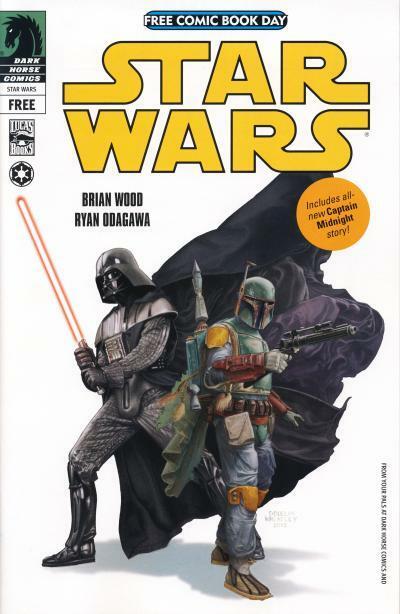 In 2006, Dark Horse published a Star Wars/Conan flip book and for the remaining Dark Horse Free Comic Book Day offerings in 2009, 2011, 2012, and 2013, Star Wars was paired with other Dark Horse properties. 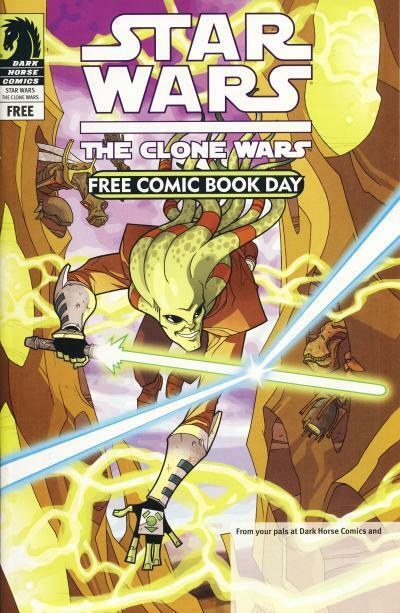 Unfortunately, Marvel did not published a Star Wars comic for Free Comic Book Day in 2015 and they do not have an offering planned this year. Star Wars #34 has one of my favorite covers of the original Marvel series. I feel Spanish publisher Ediciones Surco's cover for Star Wars: la Guerra de las Galaxias #8 is just as nice, but for different reasons. 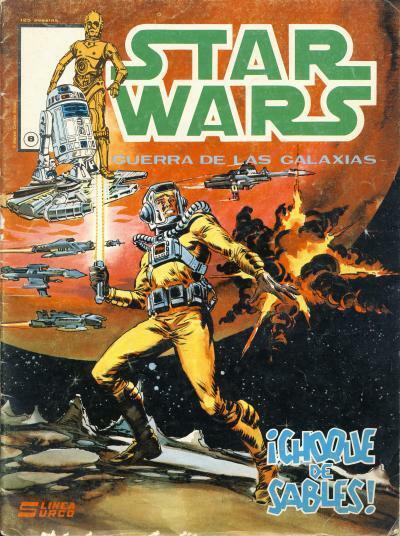 This magazine-sized comic contains Spanish translations of Star Wars #33 and 34. Unfortunately, it is the last Star Wars comic they would published. This Spanish cover has all the same themes of the original Marvel cover. Luke, wearing a yellow spacesuit, watches from an asteroid as the Rebel Fleet is led into danger by the Millennium Falcon piloted by Han Solo and Chewbacca. An explosion is shown just in front of the fleet and in the background looms a large planet. Gone are the bright purple and red colors I love about the original Marvel cover, but instead we get a reddish planet more modest in size. 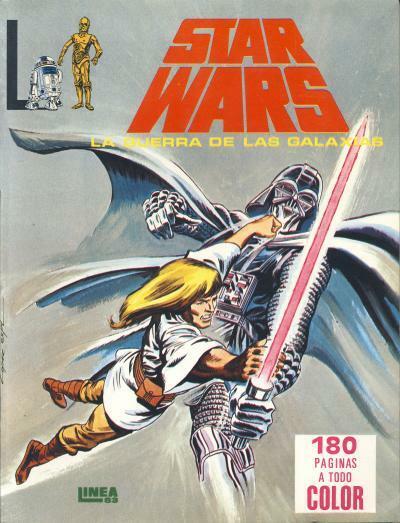 Also on the Spanish cover, the asteroid Luke stands on looks more alien and instead of Luke looking back at the fleet, he is peering ahead, ready to take action. The explosion is more intense. The blurb reads Choque de Sables! or Clash of Sabers! which is similar to the title for Star Wars #33, Saber Clash. From 1996 through 2005, Wizard published 33 Wizard Ace Edition comics. These are reprints of key comics from several eras with a card stock cover over-laid with an Acetate (clear plastic) cover also adorn with art. 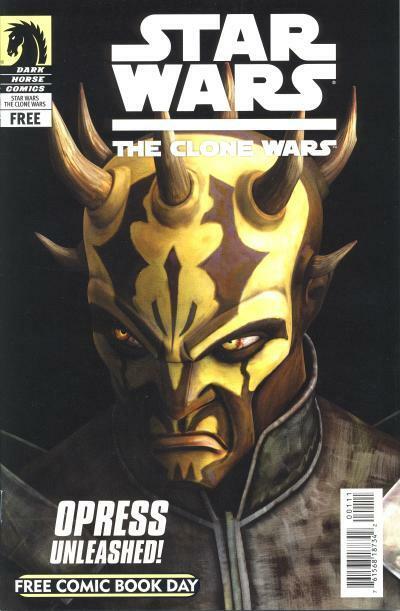 Issue #13 was released in 1997 and reprints Star Wars: Dark Empire #1 and is a mail-away comic advertised in Wizard magazine #67. 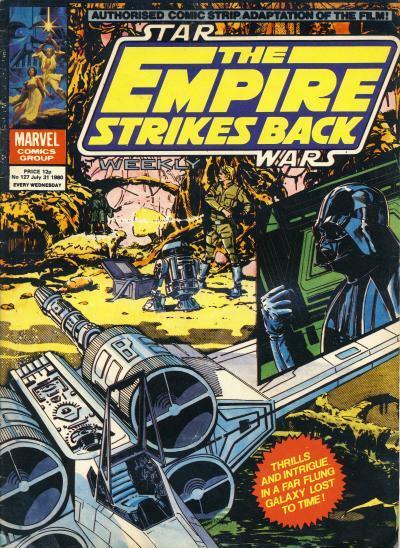 The cover is a slight variation of the one used on Dark Horse Classics - Star Wars: Dark Empire #1. It has the modified painting of a younger Princess Leia that was not used on the original Dark Empire #1 cover although she is modified yet again to make it look like her body is turned further away from the reader. The main characters are larger and centered on the cover, and much of the background scene with the AT-ATs is covered. A X-Wing Fighter is now drawn in the background, possibly taken from the cover of Dark Empire #6, as well as the visage of The Emperor, which might be from the cover of Dark Empire #5. The art is very close to the art on Dark Empire #1, but upon closer inspection, it looks like to be another painting entirely. John Byrne is one of the most popular comic book artists in the 1980s and the early 1990s. His first flirt with comic stardom came when he started drawing the Uncanny X-Men with issue #108. It was his run on the Fantastic Four starting with issue #232 that cemented his status and many consider his run second to only Stan Lee and Jack Kirby's on the title. In 1986 his popularity prompted DC Comics to approach Byrne to relaunch Superman after the Crisis on Infinite Earth's 12-part mini-series rebooted the DC Universe. In the early 1990s, his creator owned Next Men was published by Dark Horse under the Legend imprint. John Byrne only worked on one Star Wars cover. 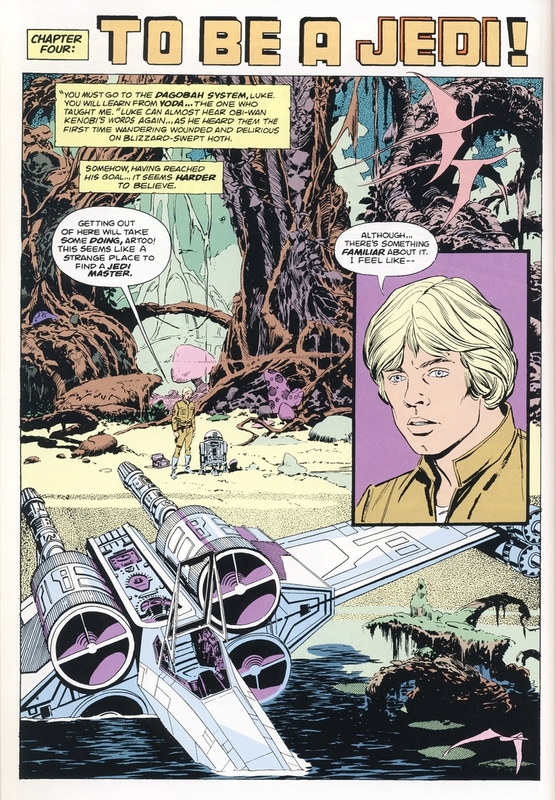 The cover to Marvel's Star Wars #13 was penciled by Byrne and inked by Terry Austin. Chewbacca's visual in the Star Wars title are not good for the first 7 issues with issue #7 having the worst interior Chewbacca art in the original title. With issue #8, Howard Chaykin is joined by inker Tom Palmer and Chewbacca's look improves tremendously. Chaykin and Palmer leave the title with issue #10 and starting with issue #11, Carmine Infantino takes over as penciler with Terry Austin providing inks. 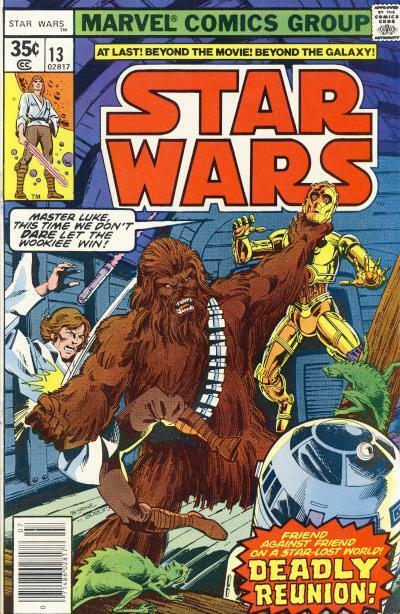 Infantino's Chewbacca is very stylized and Chewbacca would maintain that stylized look until issue #39 when The Empire Strikes Back adaptation begins with a few exceptions. One of those exceptions is the cover to Star Wars #13. On the cover, Chewbacca, as drawn by Byrne, is bulkier than his movie counterpart. Infantino's Chewbacca has long straight hair whereas Byrne's Chewbacca has flowing hair more reminiscent of his look in the movie. The cover to Star Wars #13 does a good job of showing the peril Luke Skywalker, C-3PO, and R2-D2 are in with the enraged Wookiee aboard Governor Quarg's water vessel. It is unfortunate John Byrne only ever drew one cover for a Star Wars comic. The pairing of arguably's the 1980s hottest artist with the hottest movie franchise of the era would have been exciting. Not only does the British The Empire Strikes Back Weekly have the first cover appearance of Boba Fett, but this magazine-sized comic also has the first cover appearance of Yoda. Yoda's first and only appearance on the cover of the U.S. Marvel Star Wars title is issue #50. The Empire Strikes Back Weekly has Yoda first appear on the cover of issue #127. The cover for The Empire Strikes Back Weekly #127 is an interesting combination of several panels from the interior art of Star Wars #42. The background and X-Wing are taken from page 2. 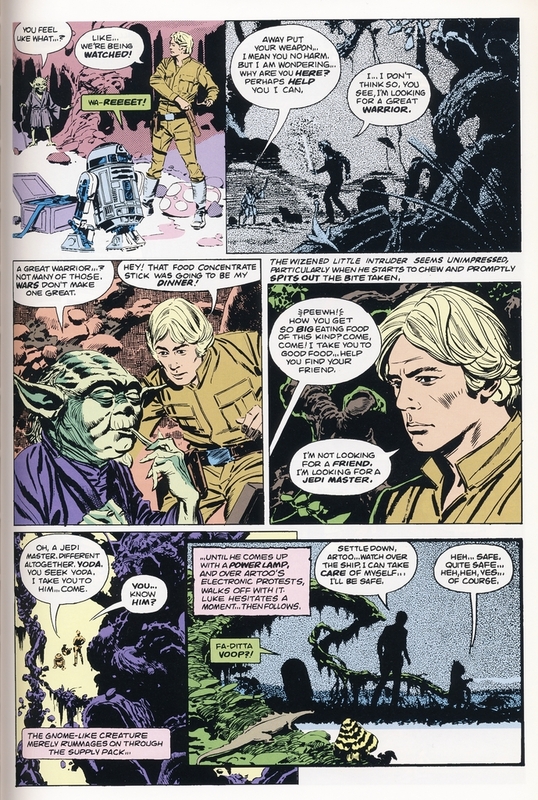 The drawing of Luke Skywalker, R2-D2, Yoda, and Luke's supply kit are taken from the first panel on page 3. The inset art with Darth Vader clenching his fist are taken from the last panel on page 6. The blurb reads Thrills and Intrigue in a Far Flung Galaxy Lost to Time! 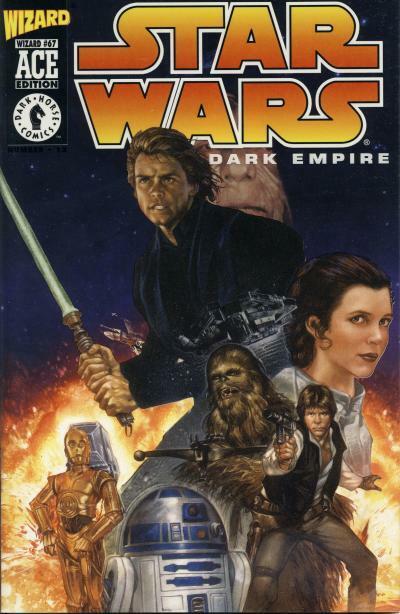 Dark Horse spent years expanding the Star Wars universe beyond the era of the original movies and when they did publish comics in the time period of the movies, they used the main heroes of Luke Skywalker, Princess Leia, Han Solo, and Chewbacca sparingly for most of their 22+ years of publishing Star Wars comics. In 2013 that changed when Dark Horse began publishing their second comic titled Star Wars which focused on the main characters between A New Hope and The Empire Strikes Back. 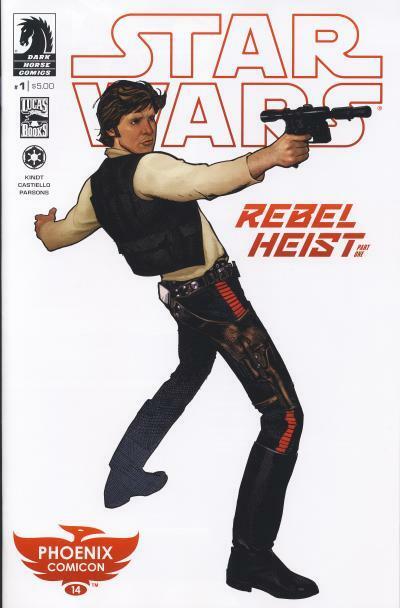 In 2014, a 4-part mini-series titled Star Wars: Rebel Heist was published. Written by Matt Kindt, best known for creating Mind Mgmt published by Dark Horse, each issue of Rebel Heist tells a story of one of the main Star Wars heroes from the point of view of a Rebel recruit. Star Wars: Rebel Heist #1 focuses on Han Solo. Star Wars Rebel Heist #1 has a Phoenix Comicon exclusive that is limited to 1,000 copies. 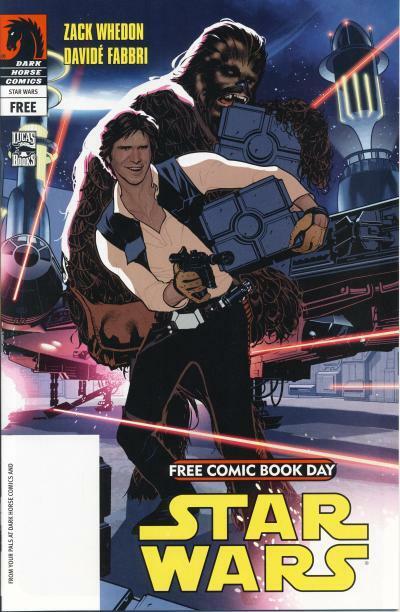 It contains the same art of Han Solo drawn by Adam Hughes on the cover of the regular issue, but instead of a montage behind Han Solo, the exclusive cover features an all white background. From March 2004 to July 2011, the official website for Star Wars sold merchandise through the online Star Wars Shop. The Star Wars Shop had its fair share of exclusive Star Wars merchandise including comics. In May 2007, Dark Horse collected the first 6-part story arc, titled Broken, from their Star Wars: Legacy title in a trade paperback. In addition to the mass retailer version of the trade paperback, the Star Wars Shop offered an exclusive hardcover. 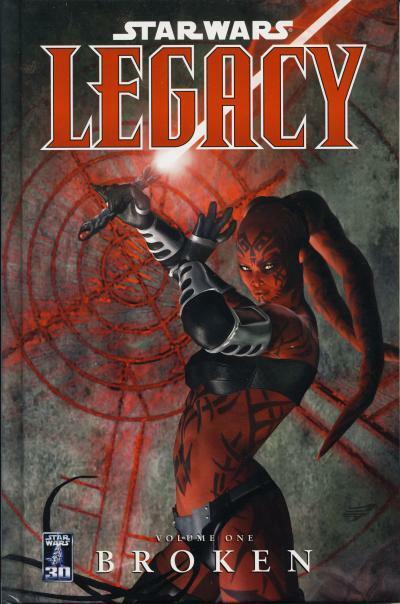 The cover features original art showing Darth Talon, a Sith under Darth Krayt, the main antagonist of the Star Wars: Legacy title. This art is used again on the cover of Star Wars: Legacy #0½. The hardcover is limited to 1500 copies. In Japan, the equivalent to a comic book is called manga. Manga is very popular in Japan and in other countries around the world. It is not unheard of for certain manga publications to see circulation of over a million copies. This was certainly true for Weekly Shōnen Magazine #18 from 1978. Published by Kondasha in Japan, Weekly Shōnen Magazine is a anthology consisting of many different flavors of manga series. Issue #18 - 23 contain the 6-part Marvel Comics movie adaption. 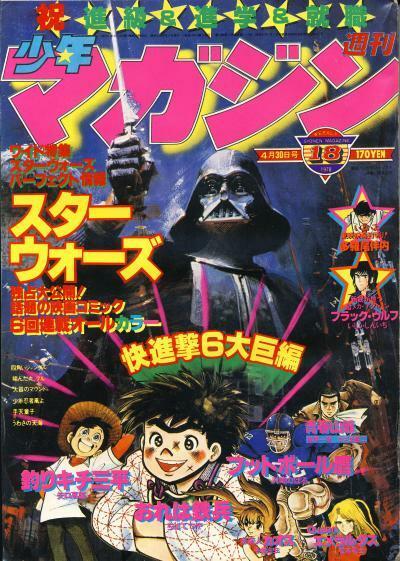 Issue #18, published on April 30, 1978, includes the Japanese translation of Marvel Star Wars #1. Unlike the other series which are read from right to left, the Star Wars pages are read from left to right. The pages are in black, white, and various shades of red. 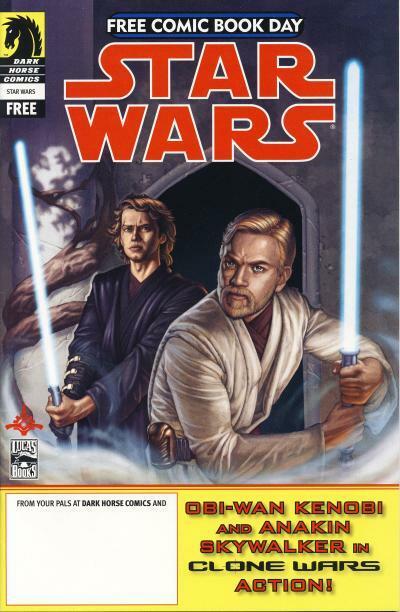 While Marvel's Star Wars #1 cover is printed inside Weekly Shōnen Magazine #18 with the interior pages, the magazine's cover art is from the hardcover book club edition of the Star Wars novel. Several characters from series inside this anthology are overlaid on the Star Wars art. This magazine is extremely thick, containing hundreds of pages of manga stories. Star Wars was released in Japan on June 30, 1978, meaning this comic was published 2 months earlier than the movie's release. 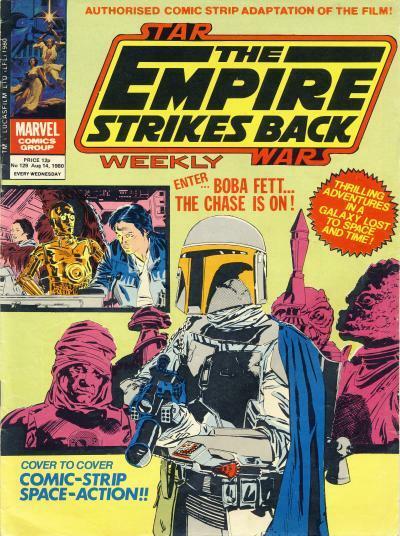 The earliest Boba Fett comic cover known is on the British The Empire Strikes Back Weekly #129 which was published on August 14, 1980. The U.S. Star Wars #42 has a cover date of December 1980 and most likely hit stores in September or October 1980. The cover excitingly exclaims Enter... Boba Fett... The Chase is On! Another blurb strangely reads Thrilling Adventures in a Galaxy Lost to Space and Time! The cover art is not original, but is instead taken from interior art done by Al Williamson. 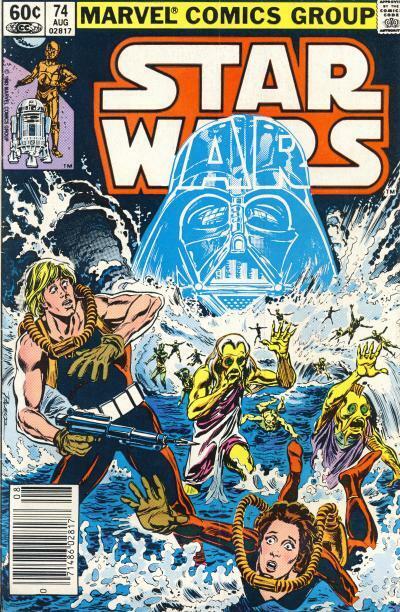 The bounty hunter art on the cover is from the splash page of Star Wars #42. The inset art with Han Solo, Princess Leia, Chewbacca, and C-3PO in the cockpit of the Millennium Falcon is taken from the first panel on page 11 of Star Wars #41. 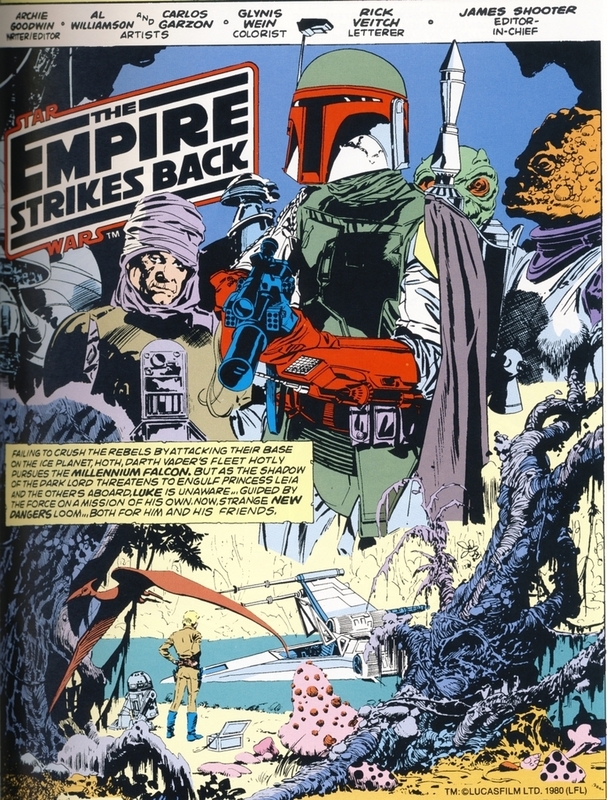 The art from the splash page is recolored on the British weekly to further emphasize Boba Fett by coloring the other bounty hunters in a uniform mauve color. Additionally, Boba Fett has orange on his helmet instead of the red seen in the movie and his cape is colored blue instead of the two tone drab colors from the movie. Unlike the splash page however, Fett's gauntlets are correctly colored the same grey as his helmet, unlike the splash page which has him sporting red gauntlets. While this is the first cover appearance for Boba Fett, it is not the first appearance of Fett in The Empire Strikes Back Weekly. The Empire Strikes Back Weekly #127 contains the first 1/3rd of Star Wars #42, including the spash page shown above. Star Wars #74 kicks off a 3 part arc that sees our heroes travel to the water planet of Iskalon in pursuit of Tay Vanis, a Rebel operator who has gone missing with information vital to the Alliance. It is a mission that would end in defeat for the Rebellion. Not only would they not find Vanis, but Iskalon would see swift reprisal in the form of a missile launched from an Imperial fortress on it's sister planet Gamandar for hosting our heroes. Luke Skywalker: If not for this landing platform we're on, there wouldn't be anything at all on the surface... Just ocean and sky, and the sun... and the other planet Gamandar... Nothing else in any direction, as far as the human eye can see... I spent my whole life on Tatooine-- a desert planet-- I use to dream of leaving it, and of seeing other worlds... But I never even imagined there could be places like this... Since I met you and Han Solo and joined the Rebel Alliance, I've traveled a lot, and I've got used to the idea that not all worlds are deserts... But I've never seen oceans like this anywhere. Luke's statement is not entirely true. His first mission for the Rebellion in the Star Wars title would see him traveling to the Drexel system, where he would crash on an unnamed planet whose surface is completely covered in water way back in Star Wars #11. The cover for Star Wars #74 is not from any scene inside the story. When the missile goes off, Luke and Leia are on the landing platform and the comic ends without showing the devastation wrought by the explosion. Darth Vader's visage is shown on the cover, although he is only mentioned in the story and would not take an active part until issue #75. 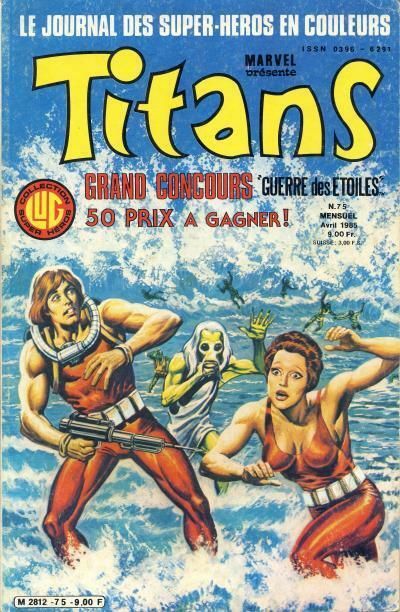 Also shown on the cover are the water breathing Iskalonians being swept along by a massive tidal wave. Leia has fallen and Luke is wielding some sort of spear gun, a weapon he never carries inside the story. Finally, Luke and Leia are both wearing respirators something neither has until Luke finds one floating in the water and shares with Leia in the next issue. 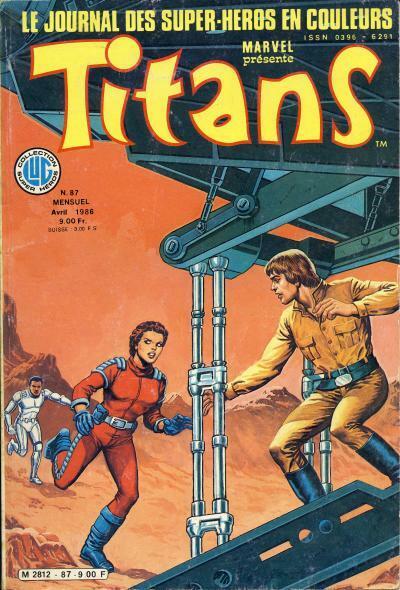 The cover for Titan #75 is almost identical to Star Wars #74. Missing is the disembodied head of Vader and Leia is now standing upright and running from the tidal wave without a respirator. Luke is in the same pose and, with Leia now standing, pointing the spear gun at her torso. He is still wearing a respirator. The Iskalonian standing behind Leia is now absent. While the cover to Star Wars #74 is nice, I like the cover to Titans #75 more. Not having Darth Vader's head, while symbolic, allows for the full effect of the tidal wave approaching Luke and Leia to be felt. Leia does not look helpless splashing around in the water and the painterly look of the French cover really brings out the blues. For the first 11 years, the Star Wars line of comics had several editors before Randy Stradley became the senior Star Wars editor at Dark Horse Comics in 2002. For the next 13 years, Stradley would oversee what would prove to be Dark Horse's most successful license. 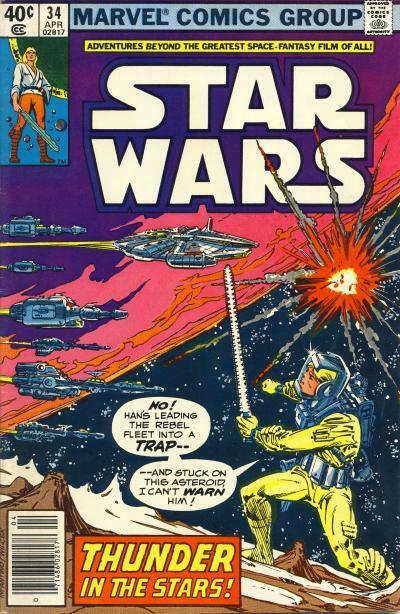 Interestingly, Stradley got his start in comics writing the story for Marvel's Star Wars #86, his first and only story for the original Star Wars title. Titled The Alderaan Factor!, Star Wars #86 contains the final solo Princess Leia story in the original Marvel title. Leia is aboard a Yinchori shuttle to negotiate with the Yinchori elder council when it comes under attack by a pair of TIE Fighters. It turns out the Yinchori on the shuttle have betrayed Leia to the Empire in exchange for their now captive council. Leia downs one of the TIEs, but the remaining enemy craft succeeds in damaging each other and both the shuttle and TIE Fighter crash on Yinchor. The Imperials that have the captive elder council learn of the dogfight. Led by Governor Wessel, they head toward the crash site to confirm Leia's death. Meanwhile, the Stormtrooper survived the TIE Fighter crash and makes his way to the down shuttle. There, he helps free Leia and we learn the Stormtrooper is an Alderaanian and he wears a fragment of Alderaan as a pennant around his neck. Alderaan is not immune to class warfare as the Stormtrooper, who was a servant on Alderaan, and Leia begin arguing. They are attacked by creatures called Rolk-Mangir who wound the Stormtrooper and Leia retrieves his blaster and defends both herself and the Stormtrooper. They are driven to a cliff where Leia falls and the Stormtrooper saves Leia and recovers his weapon in the process. More arguing ensues when the Stormtrooper makes the decision to bring Leia in as his captive. Governor Wessel, upon confirming Leia's capture, orders the Yinchori council killed. Just then, the Millennium Falcon appears to rescue Princess Leia. Wessel is about to kill Leia when the Stormtrooper from Alderaan has a change of heart and stops Wessel. As both Leia and the Stormtrooper race to the Falcon, Wessel shoots the Stormtrooper. Leia grabs his hand as the Falcon takes off but his body is too heavy and he falls to his death as Leia is left holding the pennant. Now safely aboard the Millennium Falcon, Leia, clutching the pennant, sobs over the loss of her home world and this unnamed Imperial soldier. The cover for Star Wars #86 shows the Stormtrooper saving Leia from falling to her death. I think this cover does a good job of showing the conflict between Leia and the Stormtrooper and helps sell the issue by making the reader curious to know how Leia gets out of this predicament. Notice Leia is wearing different clothes than she wears in any of the movies. The angle of the shot just above the Imperial soldier looking down into the chasm lends excitement to the dangerous situation Leia is in. The cover for Titans #87 shows Leia and the Stormtrooper racing towards the Millennium Falcon. Leia is glancing behind her with concern, making us believe it is the Stormtrooper who she is concerned about when readers of the story know it is Governor Wessel and the other Stormtroopers with him. This cover is fairly static and unexciting compared to the original Marvel cover. The sense of danger we feel for Leia captured on that original cover is lost here. There has always been one thing about the story that never made sense, why is the pilot of a TIE Fighter wearing standard Stormtrooper gear? Also, the stormtrooper rifle depicted is based on the Kenner stormtrooper gun and not the rifles used by Stormtroopers in the movies. It is humorous to think the artists for the original Star Wars title used Kenner toys, as inaccurate as they were, as models for their drawings. The Comics Chronicles released the March 2016 estimated sales. This month saw very little change in the sales estimates from last month with all titles down slightly. After the ups and downs of the last few months due to the Vader Down event, this month saw the number of units sold for the Star Wars and Darth Vader titles settle with little changed. It is normal to see titles shed a few sales from month to month and this month proved no different. Overall, if you consider all the new Marvel #1s that came out in the past 6 months, both these titles have fared very well and maintained their top 10 positions on the monthly charts. Obi-Wan and Anakin #3 saw a standard third issue drop. Kanan #12 is the final issue and it was little changed from last month. March has proven to be an uneventful month with regards to sales, but that was to be expected with no events or new Star Wars titles. April will be more interesting with the debut of the ongoing Poe Dameron comic and the C-3PO one-shot. I also expect Marvel to have some announcements over the summer to inject some renewed focus into their top selling brand. The average sale per issue would rank 9th on the top 300 chart for the month of March. As predicted, this month saw another drop in average sales per issue due to no new event or a #1 being released. Star Wars trade paperbacks are selling well and reorders remain strong. Please read the blog posting March 2016 Comics Sales Estimates online: Batman tops 163k copies, Walking Dead Vol. 25 sells 19k. The Poe Dameron comic is shaping up to be Marvel's version of Dark Horse's Star Wars: X-Wing Rogue Squadron. It will center on the Resistance's top pilot Poe Dameron and his Black Squadron and is set in the year before the events of The Force Awakens. A main villain will be introduced for Poe Dameron, "An intelligence officer in the First Order with some ties to the old Empire" according to series writer Charles Soule. Soule likens this new villain to "an evil Lando." Interestingly, the occupation of this new villain mirrors the occupation of the main villain for Wedge Antille's Rogue Squadron from the Expanded Universe. 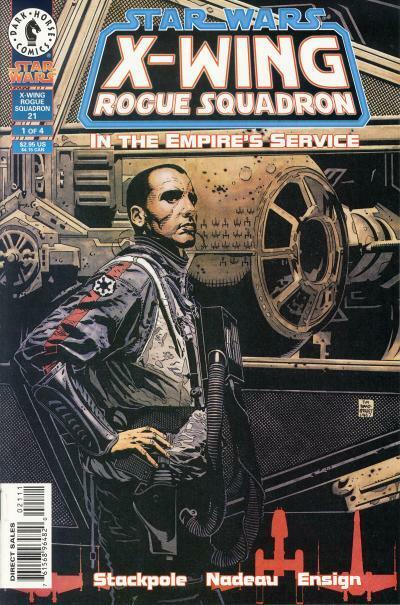 The first comic appearance of the Rogue Squadron's main villain occurrs in Star Wars: X-Wing Rogue Squadron #21. Ysanne Isard is the Director of Imperial Intelligence and the real power behind Sate Pestage, Emperor Palpatine's right hand man and successor after the Battle of Endor. She is politically cunning and ruthless; she replaced her father, Armand Isard, as Director when she accused him of treason to the Empire for which he was executed. Eventually, she engineers Pestage's downfall and for a while, assumes control of the remnants of the Empire herself. 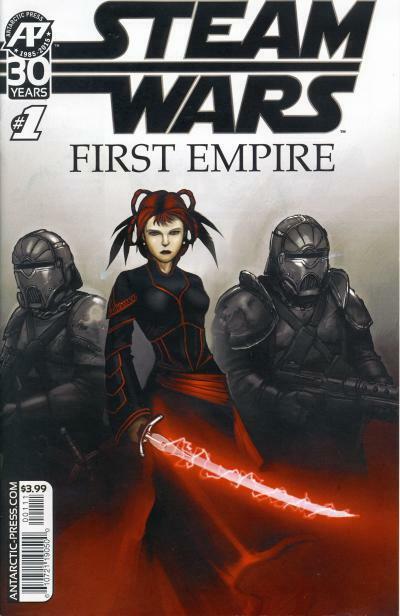 Interestingly, despite appearing in 14 Dark Horse comics and her important role as leader of the Empire after she betrays Pestage, Ysanne Isard is not featured on any comic covers. The cover to Star Wars: X-Wing Rogue Squadron #21 shows Baron Soontir Fel, who also makes his first appearance in this issue. Soontir Fel is the Empire's top TIE pilot and another fan favorite character. These next two Steam Wars issues continue to use imagery that is inspired by Star Wars. Steam Wars: First Empire #1 shows characters that I cannot relate back to specific Star Wars characters, but it is easy enough to see the inspiration. The female looks like a darksider, holding a red sword, aglow like a lightsaber. The soldiers behind the female have helmets that look like a cross between Mandalorian and Darth Vader's helmet. Steam Wars: First Empire #2 is more easily recognized for it's Star Wars root. 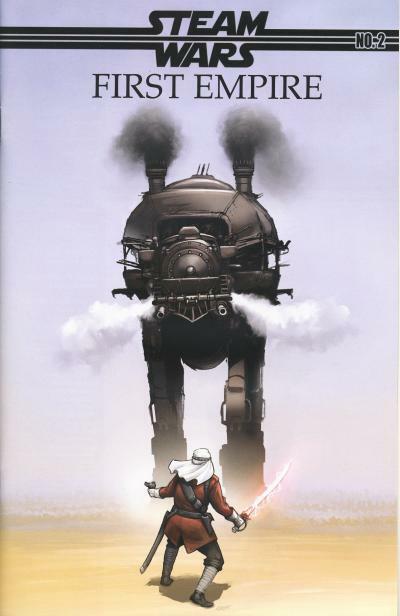 It shows a steampunk version of an AT-AT bearing down on an individual brandishing a sword and dressed in desert garb. 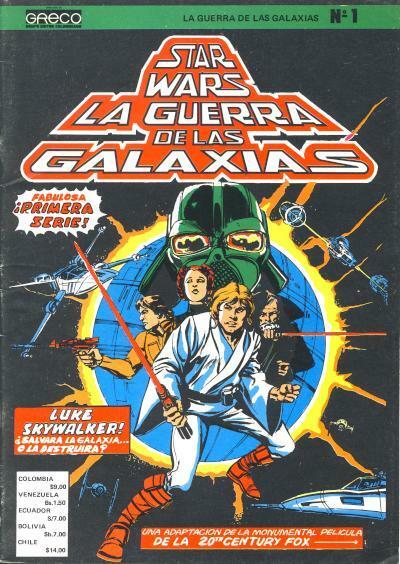 Here is a collection of Star Wars: la Guerra de las Galaxias comics published by Ediciones Surco. Like other foreign collections, this contains the bundling of the first 5 printed issues of this title including covers with a new outer cover. The outer cover art used is the same cover on the 2nd issue of this series. Being magazine-sized, it is harder to find nice condition copies of these comics. With the bundled collection, all of the issues are in very nice condition. The only drawback is they are all glued inside the outer cover. 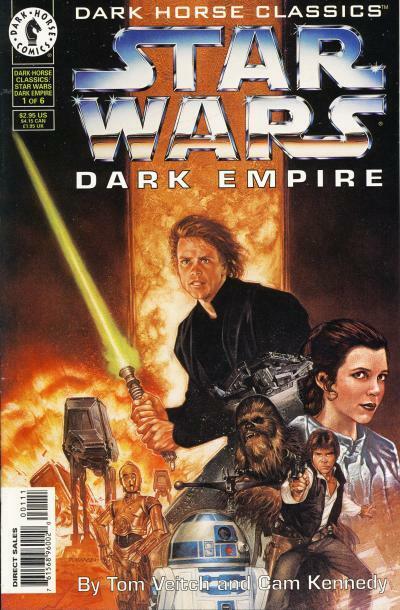 Dark Horse Comics successfully brought Star Wars back into the conscious of comic readers with Star Wars: Dark Empire in December 1991. 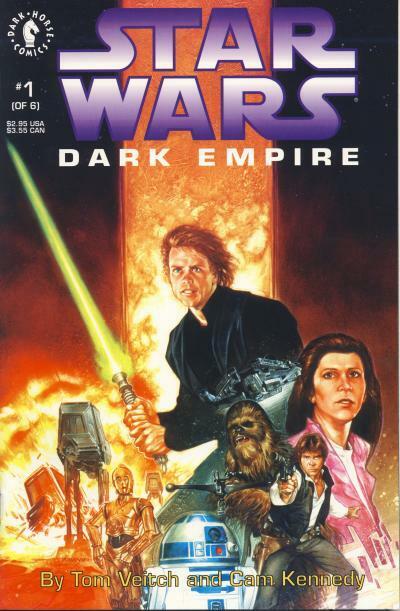 It was important for Dark Horse to follow up the Dark Empire mini-series with Star Wars comics that appealed to the fanbase, otherwise Star Wars would have suffered the fate of some of Dark Horse's other movie licenses that did not stick around long. They published Classic Star Wars stories which reprinted Marvel stories and newspaper comic strips after Dark Empire and those sold okay. The first Star Wars: Tales of the Jedi mini-series did very well and it received a followup mini series six months later. Star Wars: Tales of the Jedi, like Star Wars: Dark Empire, was a strong event book for Dark Horse and definitely drew in readers because of the new time period being explored. Dark Horse had published the first Droids mini-series which also saw a sequel Droids mini-series six months later, but that title did not do as well as Dark Empire II which began publication in December 1994, three years after the first Dark Empire mini-series began publication. It was in this environment that Dark Horse publish Star Wars: X-Wing Rogue Squadron, the title that I feel cemented Star Wars as the comic industries' biggest movie license. Star Wars: X-Wing started life as an extremely popular video game in 1993 that went on to see three sequels: TIE Fighter in 1994, X-Wing vs. TIE Fighter in 1997, and X-Wing Alliance in 1999. Bantam Books saw promise in this expansion of the Star Wars universe and hired Michael Stackpole to bring Star Wars: X-Wing Rogue Squadron to novels. Dark Horse wanted to collaborate with Bantam and Stackpole was hired to also write the comics. The Star Wars: X-Wing Rogue Squadron comic mini-series debuted in July 1995 and the first novel came out in 1996. At first, Michael Stackpole was assisted by other comic writers, but by the end of the comic title's run, Stackpole was the sole writer of the stories. Star Wars: X-Wing Rogue Squadron was extremely successful as a novel series. Many people feel that next to the Thrawn Trilogy, these books were the best Star Wars novels to be published by Bantam Books. Dark Horse had originally only planned for three mini-series, but the success of the title led to it becoming an ongoing series that ran for 35 issues. 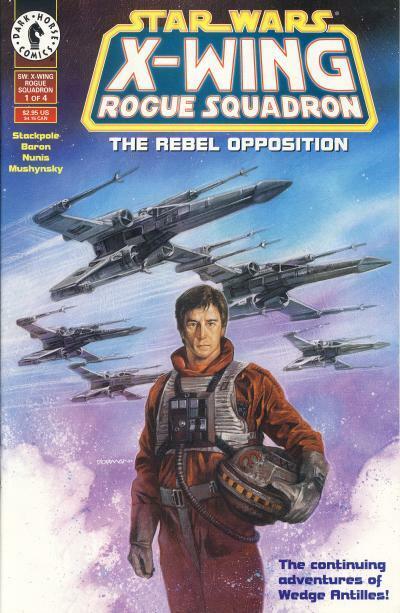 Both the novels and the comics featured stories that revolved around fan favorite Wedge Antilles, who assembled a cast of New Republic era pilots for the crew of Rogue Squadron. The comics focused on the early days of the squadron after Return of the Jedi, while the books took place a few years later and focused on the squadron's part in the toppling of Imperial control of Coruscant. The cover to Star Wars: X-Wing Rogue Squadron says everything you need to know about why this series was a success: The continuing adventures of Wedge Antilles! Wedge was a character that had survived the major battles of all three original movies and had developed a fan following. The cover is a simple one, Wedge, decked out in his Rebel Pilot uniform, is posed in front of a squad of X-Wing Fighters flying overhead. As you can see, the title was originally conceived as a 4-issue mini series titled Star Wars: X-Wing Rogue Squadron - Rebel Opposition. Star Wars: X-Wing Rogue Squadron was the first Star Wars comic that played loosely with what was a mini and ongoing series. The first 20 issues of this series were labelled on the cover as if they were each part of a 4-issue mini-series. But, the 21st issue is labelled as such on the cover as well as subsequent issues. In effect, X-Wing Rogue Squadron was a series of mini-series. Since mini-series are simply story arcs, in a way, this is pretty much how most mainstream comics are published today. I recall having each arc cataloged as a separate title until issue #21 came out, then I quickly went back and changed it to a single ongoing series. Publishers have been throwing curves at comic collectors like this since they first began publishing comics which always makes identifying and cataloging comics fun.